Falkner looked and said" You think you can beat my pigdetto"
Falkner laughed" Pidgetto use roost now!!" Pidgetto healed half its hp. Gold said"Damn,its almost back to full health." Gold said "Im losing damn"
Pidgtaro use "Sand attack then gust!" Falkner said "WOW! thats amazing"
Gold said "Pidgtaro lets end this rapid quick attacks now!!" Pidgetto was being hit by multiple quick attacks and when the sandstorm settled pidgetto was on the ground KOED! Gold said " Yahoo!! Green i won!!!" "Yay, now off to the Ruins Of Alph!" Green shouted before leaving Gold behind at the Gym. Upon arriving at his destination, Charlie got lost. He had no idea that Ecruteak City was as large as Olivine. He thought that maybe by using the towers to guide him he could at least get somewhere. Unfortunately, the towers were now blocked from view, as the houses in the area were also quite large. It also didn't help that there was a large crowd of people going around their daily business. As he wondered along in amazement of the large city, an oddly dressed girl ran into him. She helped him up, and said sorry. She then left, as if nothing had happened. However, just around the corner, Charlie spotted what seemed like the same girl disappear around the back of a building. Charlie noticed that the building seemed familiar. Then he realised that it was a Pokémon Gym. From what he had heard, the Pokémon Center wasn't far from the Gym, and sure enough, the Pokémon Center was just a few houses away. He headed straight towards it, and was relieved to find it relatively empty. Green ran along the road to the Ruins of Alph, where he found an odd looking tree and some people huddled around it. "Uhh what's going on?" Green asked, a hiker man answered "This tree is blocking the road to Goldenrod City. We have been thinking of trying to pull the tree out but it won't work" he finished. Green thought hard and decided to try to be a hero "Charmer use Ember!" Green said tossing the pokeball, Charmeleon came out and spit some embers but the tree just shook (Literally) "It's alive!" Green said as the tree shook itself. "I'll be back later" Green said as heading towards the Ruins until he realized he left Gold behind. "Lay Go!" Green shouted tossing the pokeball as the little bug pokemon stared intently at Green "Go find Gold and show him the way to the ruins" Green said then pointing towards some old looking ruined out buildings "Use this as a landmark if you get lost okay?" Green said. Ledyba nodded than flew off to find Gold. "Come on out PomPom" Green said as PomPom and Charmer were playing around. "We're gonna wait for Gold okay? So while we wait we shall train!" Green said. Before challenging the gym, which he knew he wouldn't do very well in anyway, Charlie decided to take a look around the area. Checking the Pokégear his mom gave him, he found that he was heading south, towards Goldenrod, or Violet City, it depended which route he took. After checking his Johto Region info book, he found that the easiest Gym Leader to beat was supposed to be Falkner, who hailed from Violet City. But of course, when he got to the turning point, there was some sort of tree blocking the way! He saw a boy release a Ledyba, and tell it to go look for something, or someone. Charlie noticed that the tree didn't seem very much like a tree, as it didn't have many branches, and had no leaves at all on top. "Hmm. Maybe it isn't even a tree at all! I know, I'll try some Pokémon attacks on it. Beam, go! Use Bubblebeam!" Green, PomPom and Charmer were randomly training when they heard "Use Bubblebeam!" they turned and saw a boy and a Tentacool watering the tree? Green then walked over and saw that the tree was shaking furiously then pulled it's roots out the ground and was angry? "Sudo!" It shouted, Green got his pokedex "Sudowoodo, the Imitation Pokémon. This rare Pokémon hides in trees to avoid capture." the pokedex finished. "Charmer Return! PomPom use Agility Multiple Times, We have to help out the trainer!" Green said. (Even though Merc can handle it) "Now use Baton Pass and Switch with Charmer!" Green said knowing that a speed increase to Charmer wouldn't hurt. PomPom returned to it's pokeball and Charmer came out and ran towards the Sudowoodo "Now use Dragon Rage!" Green told Charmer as the other boy and Sudowoodo battled. Charlie was taken by surprise when the tree suddenly began to attack. The boy he had seen walk away earlier had begun to set-up an attack on Sudowoodo, so Charlie kept Sudowoodo distracted. A Dragon Rage attack came flying in from the other trainer's Pokémon, meaning Sudowoodo was caught between Beam's Bubblebeam and the Dragon Rage attack. Charlie already realised that Sudowoodo wasn't a water type, so he had no interest in catching it. "After you, I don't want it!" he called over to the trainer. "All right, Rock types are pretty tough after all!" Green said reaching into his pocket for an empty pokeball. After finding one he threw the pokeball at Sudowoodo "Go pokeball!" he said just before Sudowoodo tried getting back up. Once, The other kid who's name hasn't been learned by Green yet was staring at the pokeball. Twice, it seemed like he was seeing if Green had any battle skill whatsoever. Third time, this kid's skill was almost as great as his, maybe Gold wouldn't mind if another trainer joined their ranks to be the best in the region. Ping. Green walks up to the Trainer and holds his hand out as a greeting "Hey there I'm Green Oak, and who might you be?". "Hey there, nice to meet you. I'm Charlie Edwards, from Cianwood Island. Where might you be from Green?" "I'm from Pallet Town in the Kanto Region on a quest to fill this pokedex out for my gramps" Green said showing Charlie the Pokedex filled with some pages. "Wow! That's awesome! That Pokédex will be really useful I bet, it's a shame I don't have one. Anyway, where are you headed now? I'm off towards Azalea Town myself." "Same but I'm waiting for my friend... I kinda ditched him by accident so I sent Ledyba to go fetch him, but first I have to investigate a mysterious power in those ruins" Green said pointing to the Ruins of Alph. "Professor Elm was supposed to investigate but he's busy studying the different ways Pokemon Evolve, you know right?" Green asked testing if Charlie's mind was as sharp as his battling skills. "Professor Elm? I think I heard my parents mention him a few times. I don't really know that much about him though, except that he's a Pokémon Professor. Kinda like Professor Oak....wait a second, you said you're filling out your Pokédex for your grandpa, and your last name is Oak, and the only guy I know who hands out Pokédexes is Professor Oak, so you must be his grandson! That's awesome. But no, I didn't know Elm studied evolution. We're behind the times on Cianwood, you see." "Well there are many different way a pokemon transforms through an evolution process, or evolve for short. Some evolve when they become stronger, some evolve through friendship, and some evolve when they come in contact with special stones" Green said pulling the Shiny Stone out of his pocket. "And Supposedly some evolve during trades, or so I've heard anyway. That's what Professor Elm is studying, all the different ways Pokemon evolve. He's also studying why some pokemon don't evolve, and know he's studying eggs. My friend Gold has an egg right now but we don't exactly know what's inside of it, so we're battling Gyms until it hatches" Green said knowing he was ranting just like Professor Elm and his Grandps. "Eh, I already knew what evolution was, and the different methods, what I didn't know was that Elm studied it, that's all. Say, you seem a pretty good battler. How about a battle whilst you wait for your friend?" "Sure what battle style shall it be? Double, Single, Etc?" Green asked Charlie while he thought what is taking Gold so long... he's probably flirting with girls at the trainer school I bet. "Yeah I got a Gym Badge see?" Gold said showing the badge in his hand bragging about his battling skills to the girls while Ledyba was tugging his shirt "Not now Lay I'm busy getting some Numbers" Gold said while typing some numbers in the Pokegear in the other hand. "Singles I guess, three on three, seeming that we both have three Pokémon." "All right then" Green said getting out a pokeball "Go PomPom!" Green shouted when a hiker suddenly stood in front of Charlie and Green, "Thank you kids for clearing up the path of that pesky tree" he said. "Your welcome?" Green said knowing someone was probably going to clear the path anyway. "We hikers help others out when they need it but this is probably the first time some trainers helped the hiker out, let me thank you by giving you two this HM" He said handing a disk to Charlie then to him. "Now I'll get out the way so you two can battle" he said standing next to some other people. I think he'll send out Tentacool first so I'll send Aipom first. Green said throwing the pokeball than shouting "Go PomPom!". The Tentacool and Aipom stared eachother down, anxious to get this battle started. "That won't do anything to Beam. Okay Beam, use Acid!" "Ugh, I forgot about Clear Body. PomPom, move to the left and Scratch!" The purple ooze completely missed the purple monkey. It seemed Beam's aim was still not too good. Beam was scratched hard by PomPom's well aimed Scratch attack. "Hold on! Let's try Supersonic!" Again, Beam completely missed the target. Beam was taken by surprise, and didn't use an attack when Charlie next said to. "Let's finish this with a final Scratch attack, go!" Beam was now out for the count, being unable to move out of the way fast enough. "You did well Beam, return." "Same for you PomPom, take a good rest." Chelsea walked into Violet city. Ganny was walking behind her, and Nox was resting safely in his pokeball. Along the way to Violet city, Chelsea trained both of her pokemon up some levels. Ganny's level is now 18, while Nox's level was raised from 3 to 11. Chelsea walked alongside Ganny as the two explored the city, looking for the Gym. "Pihh.." Ganny sighed as she flopped on the ground, tired from a whole day of training. Chelsea looked at her pokemon and smiled. "Okay, Let's find that pokemon center and get you rested.." Chelsea searched the town while holding Ganny. She stopped infront of a big building and read the sign in front of it. 'Pokemon Gym' She shrugged. "Well, at least we found the gym.. lets find the center first, though." It took her a while, but finally, she found the pokemon center. Chelsea approached the lady behind the desk and Ganny sat on the table infront of her. "Can you heal my pokemon for me?" Chelsea asked as she took Nox's ball from her belt. The lady behind the desk nodded and took Ganny and Nox in the room behind. Chelsea found a seat for herself and waited. The lady came back a few minutes later and handed Chelsea Nox's ball. Ganny jumped to Chelsea's shoulder and Chelsea thanked the lady. Outside in Violet city, Chelsea and Ganny headed straight for the pokemon Gym, but along the way, she stopped at the pokemart to get a few more potions (3). Then Chelsea made her way through the Gym's entrance. 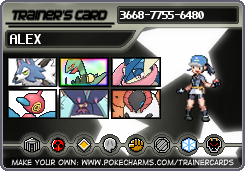 "Time to face our first Gym battle, Ganny". Ganny squinted at her "Pikah!!" After a while, Alice noticed her bag was being pickpocketed. She jumped and thee pickpocket ran away. Alice gave chase after finding her bag was significantly lighter than it was before. Alice ended up in the Underground, where scary stuff happens all the time. It was dark and awkward, but Alice kept her pace in chase, until she managed to catch up and push the pickpocket to the side. "What the heck was that all about?!" said Alice as she retrieved what was taken. The pickpocket stood up, and without saying a word, pulled out a Poke Ball indicating his intention to fight. "Alright, you asked for it!" yelled Alice quite indiscriminately. bumping epic thread. Ace you need to post the 2nd part of our battle. Gold got all the numbers he wanted and went to heal his pokemon with Lay following behind, than he headed towards the ruins. Green than proceeds to send out the same Sudowoodo that tried to kill him no more then ten minutes ago. "Go Blitz!" says Charlie. "Statue stay still and maybe Gyrados won't notice you!" Green said but sure enough Statue shook his head no and proceded to do what it wanted to do. "Blitz use Water Pulse!" Charlie said as the Gyrados almost drowned Sudowoodo. "Statue quick use Rock Throw!" Green said but Statue merely shook his head again and took a snooze. "Now's our chance Blitz, Finish him off with Water Pulse!" Charlie said before winning that round. When Statue was defeated Green knew they had some serious training to do. "Great job Blitz, return. It's up to you now Aqua, Go!" Charlie said. "Okay Charmer, this is it! We've got to win this!" Green threw the Pokéball into the field. "Let's start this with Bite, let's go!" Aqua lunged at Charmer, and just made contact as the smokescreen blinded it. "Ugh. Try a Scary Face!" It was too late. Aqua had jumped out of the smokescreen and hit Charmer dead on with a Scary Face. "Now he's much slower! Try a water gun!" Another ball of smoke was sent towards Aqua, but it was sent straight back by the powerful Water Gun. "Brilliant Aqua, try Bite again!" "Charmer, counter with Dragon Rage!" Aqua yet again jumped at Charmer, but was sent flying back by the Dragon Rage. "Great job, now go in for a Scratch attack!" "Aqua, jump out the way, he's too slow to hit us with physical moves! Try Water Gun again!" As Aqua tried to get away, it blasted Water Gun from it's mouth. However Charmer managed to swing around the Scratch attack, and hit Aqua full on, sending Aqua away to his left. Aqua's Water Gun completely missed. "Yes Charmer, we did it!" "It's not over yet! Look, he's glowing!" "Uh-oh.... he's evolving! Charmer, we can still pull this off!" Aqua glowed a perfect white colour, before completely changing form. Charlie looked over to Green, who was looking in his Pokédex. He heard him whisper to Charmer that Croconaw was low on health, and one more attack should finish him. "Aqua, over here quickly! Eat this." Charlie handed Aqua a Sitrus Berry. "Hey what! That's not fair!" "You didn't say we couldn't use items, so I used one." "Ugh. Charmer let's do this! Smokescreen!" "Send it back with Water Gun!" Charmer was once again blinded by his own attack. "Finish this with one more Water Gun!" Aqua blasted one more Water Gun at the blinded Charmeleon, knocking it straight out.